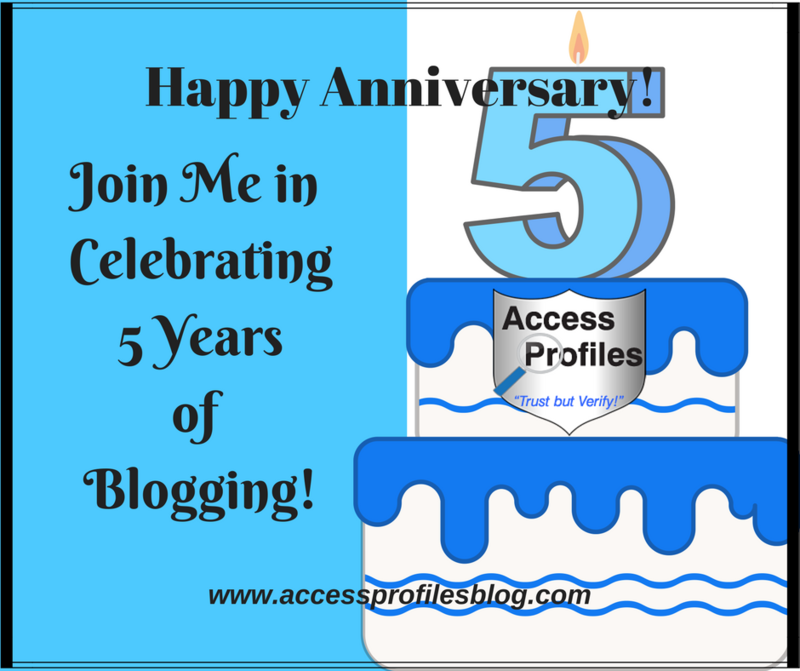 Access Profiles, Inc.: Happy Anniversary! Join Me in Celebrating 5 Years of Blogging! Happy Anniversary! 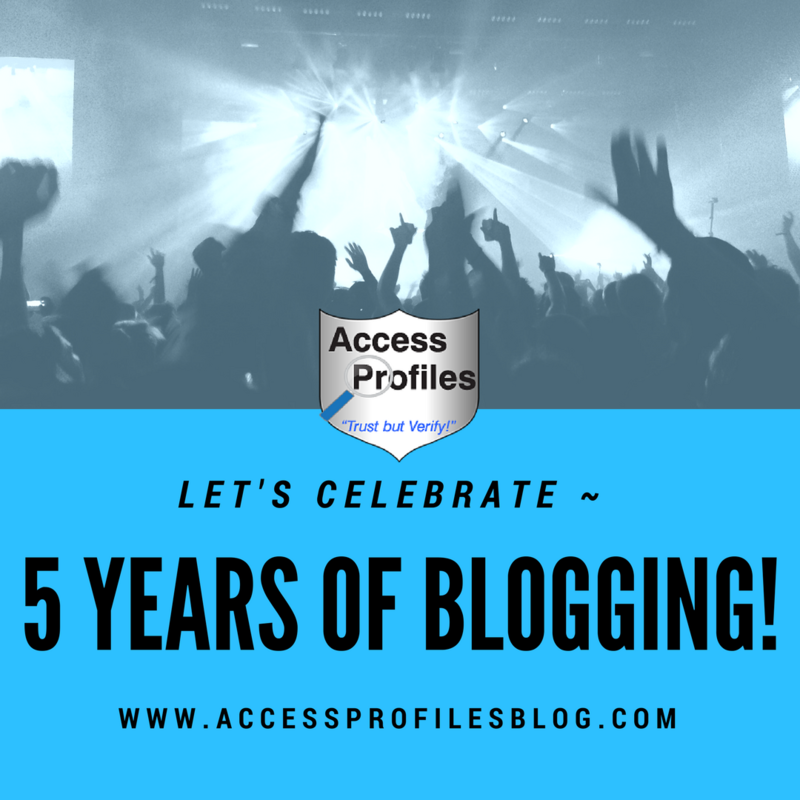 Join Me in Celebrating 5 Years of Blogging! This August, I am celebrating 5 years of blogging! In that time, I have written almost 300 articles covering everything from hiring, workplace issues, employment discrimination, and even business marketing. Through it all, I have shared my knowledge, my thoughts and opinions, and, even learned a lot myself. However, the most important thing I have gained through my blogging journey is the connections I have made. I have grown my client and reader base, “met” (both off and online) other business owners, and forged relationships with other bloggers. These connections have not only been invaluable to my business, but also to my mental well-being! Running a “solo” business can be a lonely venture. All decisions rest on your shoulders and second guessing yourself often comes with the territory. Having real-life and online friends to reach out to can make all the difference. They have been there. They know the ins and outs and can give advice or just lend an ear. Blogging has given me the opportunity to reach them in ways I don’t believe would have been open to me if I hadn’t started writing. For that I will always be thankful. So, in celebration of these past 5 blogging years, I am sharing my favorite articles. While not all of them may have gotten the most traction, these have been a pleasure for me to write ~ and many have found their own audience who sees in them what I do. First up is an article I wrote way back in 2012! “Why You Should Run a Background Check on Yourself", speaks to my desire to help both employers and job seekers. Knowing what is “out there”, and prepping your resume BEFORE you even apply, makes sense. It puts you in the best position to land the job and helps the employer easily do the screening they need. Anytime you can save an employer time and money, you are ahead of the game! Find out more by visiting my article here! Since Hiring and Background Checks is my primary business focus, I have written many articles dealing with this subject. But this particular one has always stood out to me. It dealt with a subject that I truly believe in ~ the need for people to be given a second chance! In my article, “Once a Criminal Always a Criminal, Why We need to Believe in Second Chances”, I discuss the very real problem of recidivism and hiring ex-offenders. My solution focuses on balancing cautiousness with fairness. I explore how employers can find a happy medium between giving people a chance and keeping their company safe. Check it out here! Sharing what other “at home” business owners have to say about what it really takes to run a business from home was a pleasure. In this article, I polled some of my “work from home” entrepreneur friends for their tips, suggestions, and concerns. Read more in “The Challenges and Rewards of Running a Business from Home!”. 5 Years of Blogging ~ Time to Celebrate! "Tweet This"
The next few choices focus on my love for Small Business and Small Business Owners! This favorite is really a collection of 5! It was my Small Business tips from “People in the Know” series. It was the first long “series” type of blog article I had ever written and it got a lot of feedback and interest. It’s success illustrated the power to be found in the blog “series” and the people it could reach. Most importantly, however, it fostered my love of sharing tips from real business owners about what has worked for them and the challenges they faced. I covered everything from set-up, finances, hiring, marketing, and more. Check out Part 1 (Set Up & Finances), Part 2 (Hiring, Outsourcing, & Background Checks), Part 3 (Social Media & Marketing), Part 4 (Networking), and Part 5 (General Tips & Tricks) to discover what they had to say! Throughout many of my blog articles, there has been a recurring theme ~ the Power of Small Business! Here I shared the reasons we should all be “shopping small”. But the real focus was on why, as a group of small business owners, it makes sense for us to Band Together! Building a Small Business Community helps us all “tap into the power of support and collaboration” we get from joining forces. This is something I really believe in. It drives me to help other entrepreneurs whenever I can. That is why this article has continued to be a favorite of mine! Learn more about how to foster and grow the strength of Small Business in "Small Businesses Need to Band Together"! “I Know Why I do What I Do”! It is this article that truly sums up everything I want to share about myself and my business. I found my “Why” by taking a hard look at my core values and what was truly important to me. These values then became the cornerstone of my business. Knowing“Why” has also helped me really focus. Simply said, it drives everything else I do. From how I treat my clients, the kind of services I offer, my social media presence, and, of course, my blogging! While these 6 articles sum up a lot about me and my business, and have continued to be my favorites, I don't intend for it to stop here. I am intend to share more tips and news in the years to come. I hope they will help You succeed while I continue to share my take on all things business. I hope you will join me! Subscribe Now and receive one new article each week, and no spam! Learn more about About API and our Background Investigation & Applicant Services, Business Mentoring, and Security Consulting services too!